The adventures of a wooden boy. Obsessed with perfecting his craft, young gemcutter Danilo visits the mystical Copper Mountain to uncover the secret behind its infamous attraction - the Stone Flower, a stone carving so captivating that no one can leave after seeing it. While hearing the story of "Gulliver's Travels", a young Russian boy dreams that he is the title character on the island of Lilliput. A story about ghostly marazmatik who is not satisfied with the new cohabitants. 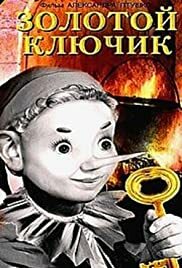 Adapted from four different Russian folk-tales, this early Soviet fantasy film tells the story of Emelya the Fool, who, fishing one day, catches a talking pike who pleads for his life and in return grants Emelya wishes for a life spared. A young puppeteer tells a story about a soldier who falls in love with a rude princess. Based on fairy tales by Hans Christian Andersen.